Rolf Suey - Better Late Than Never: Nam Cheong - What you need to know before investing in it? Nam Cheong share price peak to S$0.45 this week following two announcements of US$176mil contract wins in a space of less than two weeks. Nam Cheong's order book now boasts 25 vessels worth about RM1.7 billion. See announcement here. 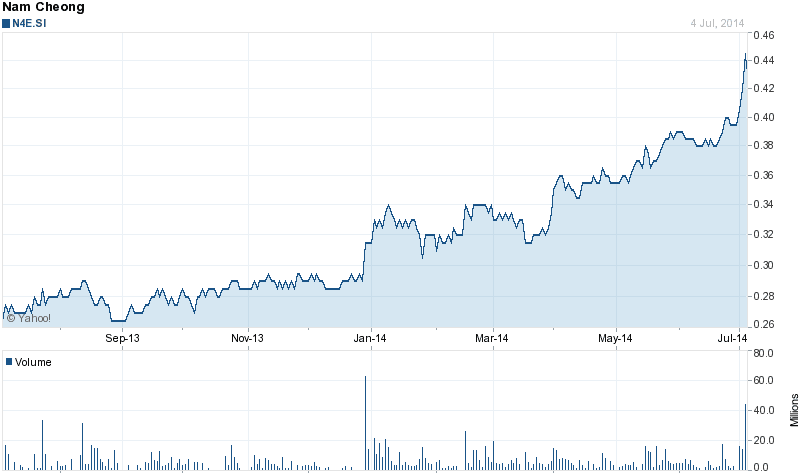 A month ago Nam Cheong share price is still trading at S$0.38. Last close price is S$0.44 representing >15% increase within a month. What is Build-to-Stock Business Model? An OSV typically takes 12-24 months to complete building. Many O&G projects may require OSV owners to have ready vessels to work within a much shorter time-frame. The mismatch in shipbuilding time and actual project requirement means that OSV owners can tap on Nam Cheong’s build to stock business model where vessels were built in advance before the actual project taking place. This help to considerable reduce the delivery time for their clients. Nam Cheong is require to know which Oil and Gas projects in preliminary bidding stage and who are the OSV players tendering for which specific projects. The need to plan what type of vessels to build, and at what time to build, requires Nam Cheong to have a extensive knowledge of the market and its requirements. In a recent interview from “Business Times”, Nam Cheong CEO mentioned that having comprehensive knowledge of the OSV market is imperative for them. Their in-depth knowledge and cutting edge engineering capabilities have also helped them to identify the most appropriate vessels to construct for their clients. 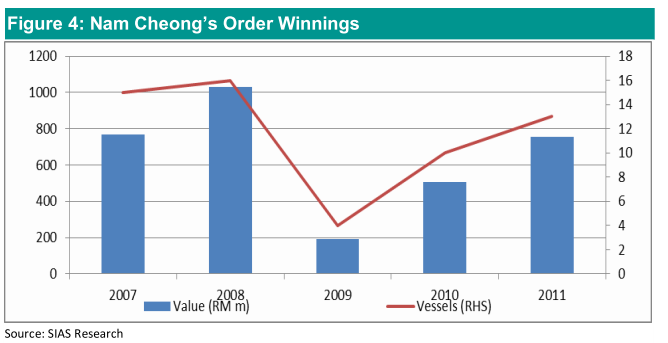 The BTS model enables Nam Cheong’s vessels to command a premium pricing. Nam Cheong is considered to be one of the largest suppliers of shallow water OSVs in the world today. Albeit higher return, its business model contain higher risks as well. The inherent risk is cash. To build a vessel upfront before a certain sale date requires financing support, increasing leverage throughout the process. Today, bank only lends with a contract backed vessels. Notably, cashflow problems claim victims such as Jaya Holdings, Drydock World, Otto Marine during the Global financial crisis (GFC) in 2008. During the crisis, oil price takes a plunge, many projects were cancelled and credit institutions tightened their lending. Fearing default payments, equipment suppliers added additional pressures to shipbuilders with a “no payment no progress” stipulation. Sandwiched between cancelled projects from clients, non-deliveries from suppliers and no-support from banks, companies who indulge in speculative building such as Nam Cheong, Jaya, Drydock World, Otto Marine are badly hit during the GFC. From above chart, we can see that Nam Cheong order wins take a huge dip to less than three vessels in 2009. In the same period, Jaya seen its share price freefall from S$2 to 20 over cents and acquired cheaply by Deutsche bank. Otto Marine still suffers from the repercussions of the cancelled orders of four VS491 ultra-large AHTS today. Drydock World filed for court protection in its financial re-structuring process and was eventually sold to Kuok group. With a good understanding of the shallow water market segment, Nam Cheong mitigates risks by only building OSVs with a broad market appeal, certified by international class society such as ABS, DNV, GL etc. Their vessels also includes more simpler and standardized designs such as 5150, 8000, 10,800 BHP AHTS, 300men AWB, 3000DWT PSV, ERRV etc. This is also one of the reasons why it manages to sold off the stock vessels after the crisis. In comparison, Otto had great difficulties selling off the four ultra large AHTS cancelled by its Norwegian investor Mosvold shipping. Jaya also suffered from its inability to sell off its more complicated high value OSVs then. To bid in Malaysia Petronas projects, you are require to have the “Petronas license to bid”. Being located in Malaysia with a many repeat clients such as Bumi, Perdana, Nam Cheong is benefitting from the local content requirement. Since 2007, Nam Cheong already sold 17 vessels to Bumi and 12 vessels to Perdana excluding the recent 2 x AWB. This is the kind of “Kampung bond” you will still find in Malaysia today. 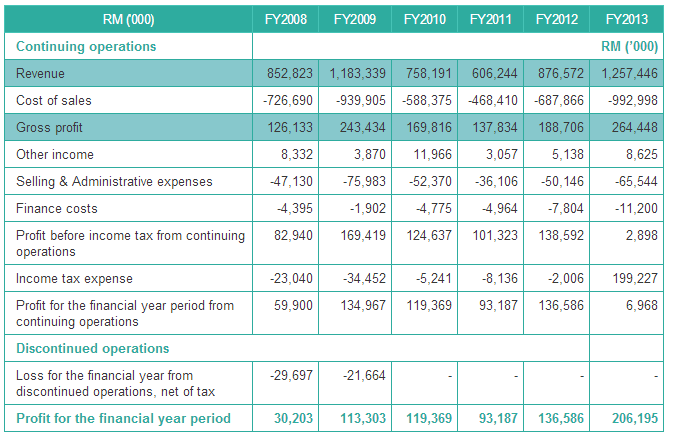 Of course the primary driver is still Petronas huge Capex plans going forward. Nam Cheong also established a solid client relationships with International OSV players. They are Tidewater (one of the largest OSV owners in the world), Europe-based Vroon and Middle East-based Topaz. In 2012, the group entered South America and West Africa markets. Nam Cheong BTS business make up >70% of its revenue today. Most of the vessels were outsourced to China yards in Fujian - Fujian Southeast, Fujian Mawei and Xiamen Shipbuilding. The outsourcing strategy allow it to have more free cash flow in its speculative new builds. It also put the risk of the leverage to the PRC yards instead. Nam Cheong generally pays 30% upfront and 70% on delivery for its newbuilding programme. Hence, the PRC yards are actually financing the construction of the vessels. Nam Cheong’s low operating leverage is reflected in its selling, general and admin expenses, which averaged 6% of sales over the past three years. Nam Cheong’s Chairman, Datuk Tiong Su Kouk is the Honorary Life President of the World Federation of Fuzhou Association and has his roots in Fujian province in China with exceptional good relationship with the Fujian local government. Today Nam Cheong is one of the biggest investors in the province with all the vessels built there over the years. Another thing you may not know is “People with Fujian Roots value relationships and display great loyalty to their close ones”. I have roots from Fujian too! Hehe! Unlike other PRC shipyards that often have quality and timely deliveries problems, these three yards are very specialized in its shipbuilding programs and often produce vessels of much higher quality and very timely deliveries. The reason is simple. Since Nam Cheong only build a niche of vessels in the shallow water range, these shipyards tend to only build “Repeat Design” vessels, and “Practice Makes Perfect!” since Nam Cheong had chunked out a remarkable more than 50 vessels from these Chinese yards. Why OSV Owners not order direct from PRC yards? Most of the China PRC yards are state-owned and do not or cannot undertake speculative builds. This is one major reason why OSV owners choose to go through Nam Cheong rather than directly approach the PRC yards. Moreover Nam Cheong has an experience team of project and design staffs located in Singapore. Being located in Singapore offshore hub, means direct access to International clients and major equipment suppliers, with better communication channels compared to PRC. In addition, Nam Cheong maintains a supervisory project teams on the ground to manage the shipbuilding process and ensure its quality and timely delivery. By buying direct from Nam Cheong, OSV owners does not have to bear the construction and financial risk and hassle of project management in dealing directly with PRC yards. The fundamentals of the oil and gas industry were sound even during the GFC of 2008-09. To me the chaotic situations in 2008/09 are a combination of over-optimism in the O&M industry and the finance-tightening by credit institutions. From the above charts, we can see that in fact vessel sales did not stop during the GFC. Companies like Nam Cheong and Coastal Contracts (M’sia) is maintaining its revenue growth in years thereafter. Having already mentioned earlier, Nam Cheong BTS model effectively transfer the risk to the Chinese yards. During the crisis, demand of vessels is low but Nam Cheong simply orders fewer vessels from the PRC yards and does not have to bear the cash operating costs and depreciation charges unlike Otto Marine and Jaya Holdings who build vessels in their own yards in Batam and Singapore. It is widespread knowledge in the industry what Nam Cheong treats its business associates with respect and trust for the benefit of all. Probably from the roots of its Chairman Datok Tiong, they also value loyalty and friendship aside from pure business reasons. This is one of the reasons why it manages to have 67% of its business from repeat clients. Beside its clients, Nam Cheong also maintains a group of loyal suppliers, based on long term working partnerships. This is unlike other shipbuilders who only select the yards or equipment suppliers solely from a profit point of view, changing from one supplier to another frequently. It is this loyalty of Nam Cheong that trades many return favors from suppliers, lending them support in cashflow, to tide through the most difficult periods of the GFC. I like the fact that Nam Cheong is able to recover so quickly from the GFC. This is even at the back of achieving remarkable growth of more than 40% yoy since FY2011. The lesson from GFC also means better adaptability in case of unprecedented events happening again. Even if there are adverse market impacts resulting from lower OSV prices, such a situation will have a delayed impact (1-2 years) on revenues and earnings. Till date, I cannot find any other companies in the world that has similar the niche. Nam Cheong BTS business model though risky is very well managed with proven track records even during the crisis. Below is Nam Cheong stellar performance for the past few years. Nonetheless, the risk of BTS is still eminent. Nam Cheong business will not be spare from a sudden change in macroeconomic landscape resulting from depressed oil and OSV prices and an unprecedented credit crunch.